I am in Kenya! I will be in Kenya for the next two and a half weeks. We landed in Nairobi where the traffic is horrendous, a 40km drive was 2 hours. We are now on the coast in Malindi for a week and than to Mombasa, another coast town and than back to Nairobi for a few days and finally we will get to see the great Wildebeest migration in the Masai Mara. It will be a very busy trip but one I wont soon forget. 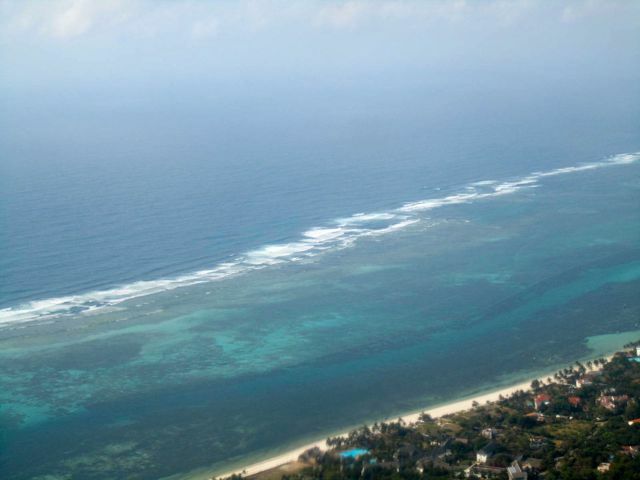 This was taken in the airplane over the coast of Kenya. I will share more photos as the days go by. This entry was posted in Africa on September 8, 2011 by Deanna. Super jealous. You guys must be having such a time. I can’t wait to see pictures of the Wildebeest migration. Post lots, please!